April 13, 2015, 1:12 p.m. These new platforms are optimized for realtime news on phones, but there are lots of questions for news organizations — from what content to share to how to measure their effectiveness. By Tanya Sichynsky April 13, 2015, 1:12 p.m.
There’s no shortage of ways to reach new audiences — the challenge is figuring out which are worth investing time in and what to do with them. At USA Today Sports, where I work, two platforms we’re trying to better understand and implement into our strategies are Snapchat and Periscope. The latter launched just two weeks ago, right before college basketball’s Final Four. I ventured to Indianapolis intent on both bringing the event to our followers on Snapchat and building a follower base from scratch on Periscope. As someone who already uses Snapchat regularly, the challenge for me wasn’t in learning how to use it, but in experimenting with the USA Today Sports account to make it as engaging and dynamic as possible. Periscope, on the other hand, was entirely new to me. A big live sporting event seemed like a great opportunity to put these apps to work. Here’s how it went. Write brief, compelling broadcast descriptions. 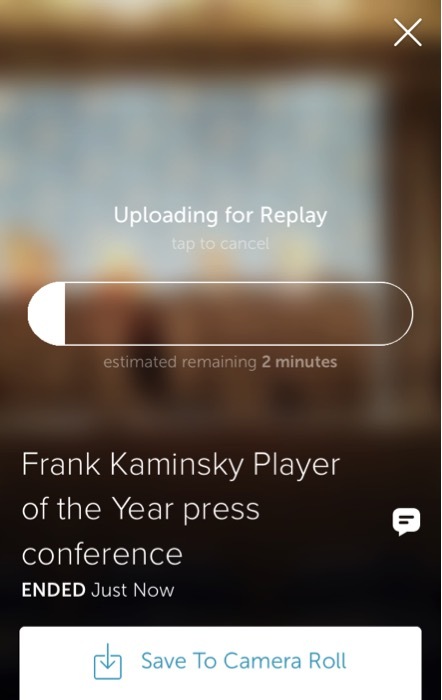 Periscope asks, “What are you seeing now?” prior to broadcasting. Your answer to that question is what gets sent via notification to your followers and tweeted from the connected Twitter account. Make sure it’s accurate and makes sense when seen out of context. Make the broadcast available for replay. Periscope gives you with the option to replay your broadcast after filming, but depending on how good your wifi or 4G service is, it may take a long time to save. If you’re trying to do one live stream after another, that urgency may cost you the replay function. Monitor replay stats close to 24 hours after posting. Once a stream has been made available for replay, it lives within the app for 24 hours, similar to a Snapchat Story. To best get an idea of how well the Periscope stream did on replay, you’ll have to check back on the post just a little less than 24 hours later before it disappears. In Periscope, you can see a live feed of viewer comments — a good, immediate indicator of how your stream is being consumed. The behind-the-scenes content we were able to bring our viewers, such as postgame interviews from the locker room, was our biggest success using the app. The comment function allowed viewers to submit questions that you can then ask your interviewee, which is very cool. 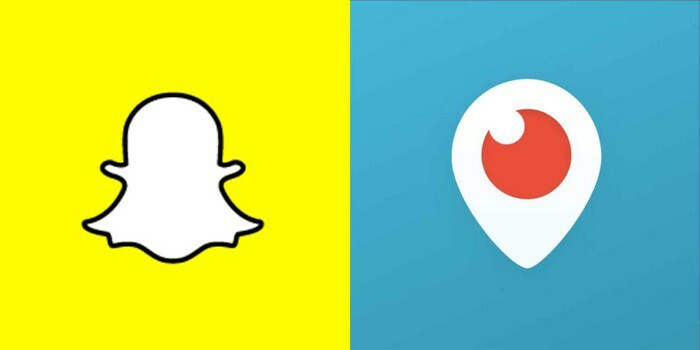 The livestream can go beyond Periscope. I streamed the Player of the Year award ceremony at the Final Four on Periscope. It was held in the morning before the day’s other press conferences got underway, and very few media members attended. 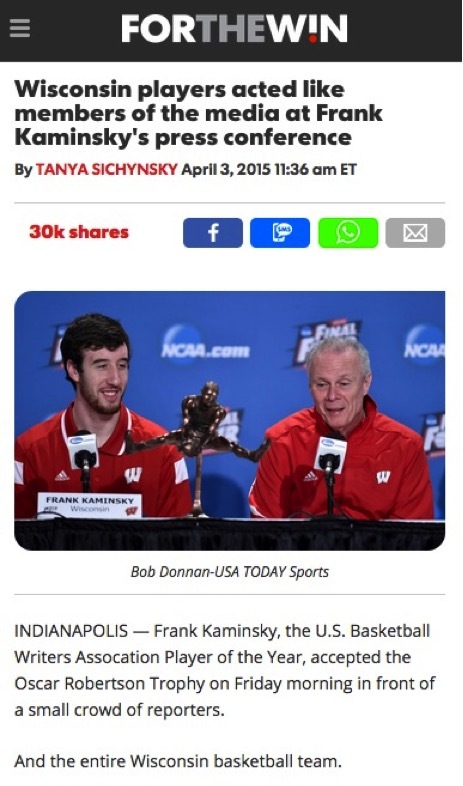 Because it was a small group, award winner Frank Kaminsky’s Wisconsin teammates posed as reporters and asked silly questions. I caught the entire thing on Periscope and a spontaneous viral moment reached our audience in a live setting. I saved the video for replay, posted photos to Instagram, and packaged it all into a story on For The Win. The viral content from the stream, which lived on the app, made the transition into a viral post that also attracted users to our site. Use screenshots of Snapchat Story posts on Twitter. Screenshots of videos or photos posted to your Snapchat Story are much more engaging on Twitter than just a simple “Follow us on Snapchat!” tweet. Sharing one of the posts on Twitter shows your followers that you’re posting in that moment and gives them incentive to follow your account. Avoid posting context-free photos to your Story. Snapchat Story posts should be more than just a photo. If it’s not an interesting video, add a caption or use one of Snapchat’s location-based filters. 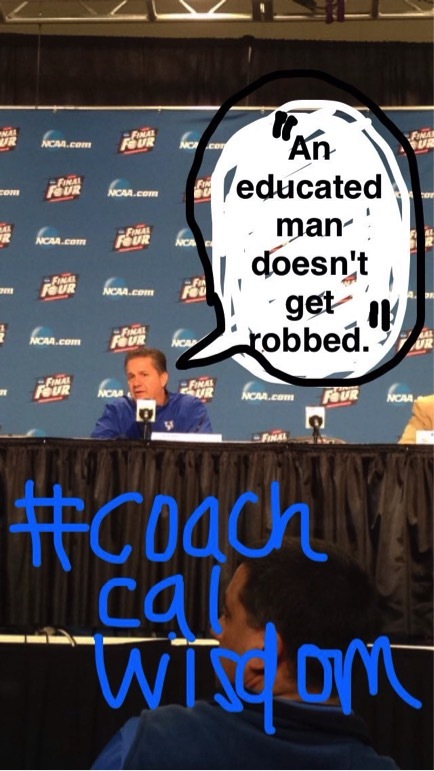 At the Final Four, I wasn’t allowed to record video of a majority of the press conferences. To combat that, I took photos and added captions via drawn-on speech bubbles with short, interesting quotes from whoever was shown in the snap. It gave followers a little something more than just a random photo, and using the drawing function is something that’s extremely popular with young people. If you have a stylus, it’s really easy. Record Snapchat Story view counts to monitor growth. Snapchat still doesn’t have an easy way for users to monitor follower counts. The only way to do so is by counting friends manually, which is tedious. However, you can look at each post within a Snapchat Story to check out the view count. Nearing the full 24 hours that a post is live, you can see just how many of your followers viewed the post, which at least gives you a rough idea of active followers. We began using Snapchat earnestly at the NHL Winter Classic in January and continued to build our audience by snapping from live events such as NHL and NBA all-star weekends. By monitoring our view stats from each of those events heading into the Indianapolis, we could tell that engagement really took off during the Final Four. Give the audience a unique experience it can’t get elsewhere. During the Michigan State-Duke game, I did a quick video at halftime with Magic Johnson talking to our followers about where the Spartans went wrong in the first half. The post gave people an expert opinion they wouldn’t hear on the halftime broadcast, and I got to talk to Magic Johnson. What a time to be alive! Periscope and Snapchat are places to get creative and experiment with the stories we’re already telling in other ways on other platforms. 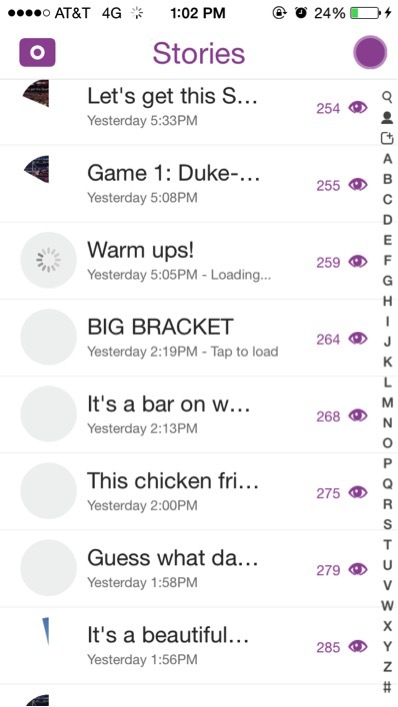 At the Final Four, I produced three days of Snapchat Stories, which consisted of 15 to 20 posts per Story. Story content had everything from videos of team practices to pictures of wild mascots. I also created six Periscope streams, which ranged from a behind-the-scenes look at the College Slam Dunk Championship to Wisconsin player Josh Gasser’s interview in the locker room after their massive win over undefeated Kentucky. Is this stuff a flash in the pan? Probably not. There’s so much potential, particularly in Periscope, to bring news to people in a different and compelling fashion, especially in the moment. Why not test and sharpen your skills with it? All it takes is time. Tanya Sichynsky is a USA Today Sports social media editor. POSTED April 13, 2015, 1:12 p.m.
Sichynsky, Tanya. 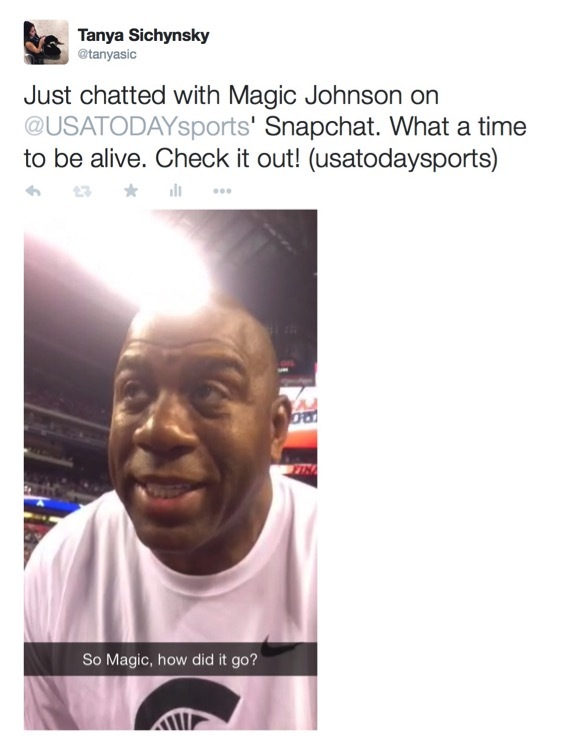 "What USA Today Sports learned covering the Final Four on Periscope and Snapchat." Nieman Journalism Lab. Nieman Foundation for Journalism at Harvard, 13 Apr. 2015. Web. 19 Apr. 2019. Sichynsky, Tanya. 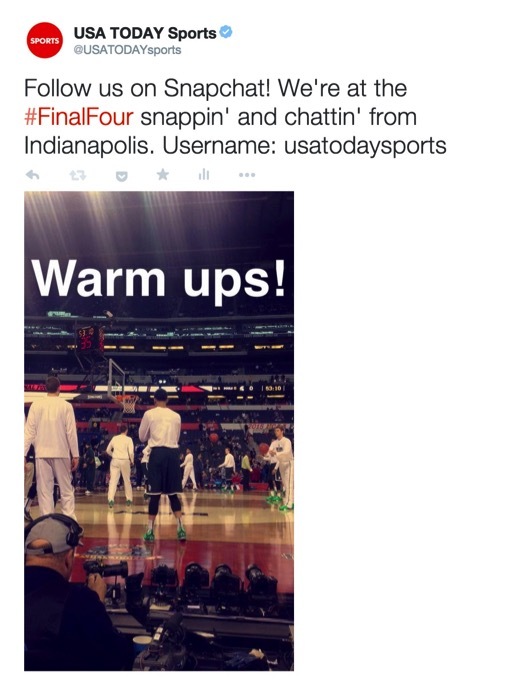 "What USA Today Sports learned covering the Final Four on Periscope and Snapchat." Nieman Journalism Lab. Last modified April 13, 2015. 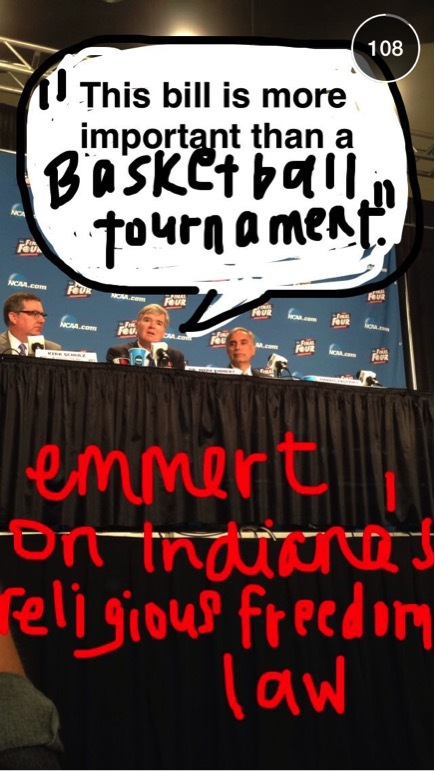 Accessed April 19, 2019. https://www.niemanlab.org/2015/04/what-usa-today-sports-learned-covering-the-final-four-on-periscope-and-snapchat/.